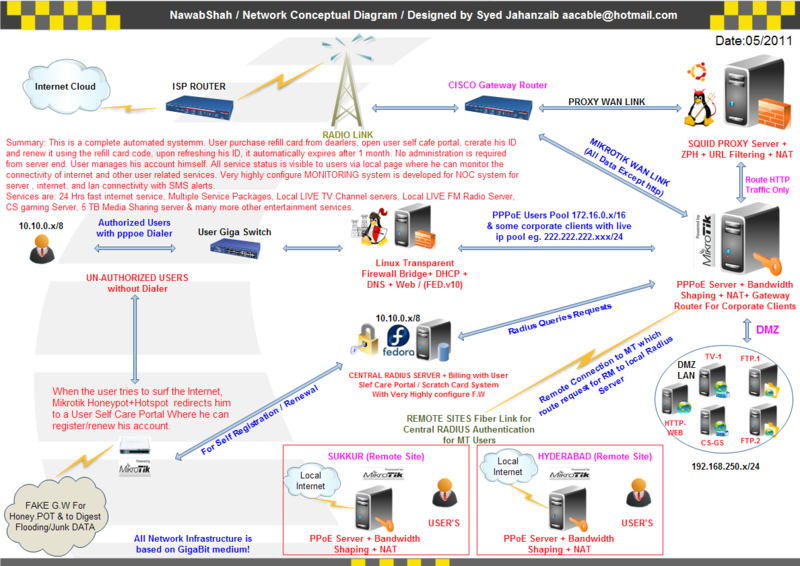 Mikrotik with Squid | Syed Jahanzaib Personal Blog to Share Knowledge ! To add SQUID Proxy Caching Server support in Mikrotik, Assuming the following Scenario. We will divide this article in two sections. Connected Directly to PROXY’s eth0 via crossover cable. Open New Terminal and create new NAT rule to redirect port 80 traffic to SQUID proxy server. Command as follows. That’s it for mikrotik configuration, If internet sharing is already configured at SQUID server, then now you don’t need to adjust any configuration at squid box, all requests will be served by squid. Now moving on to squid . . . Connected Directly with Mikrotik’s PROXY interface via crossover cable. Where eth0 is LAN interface of SQUID. and you will see User Browsing request coming via Mikrotik ip. For more information, Read the below . 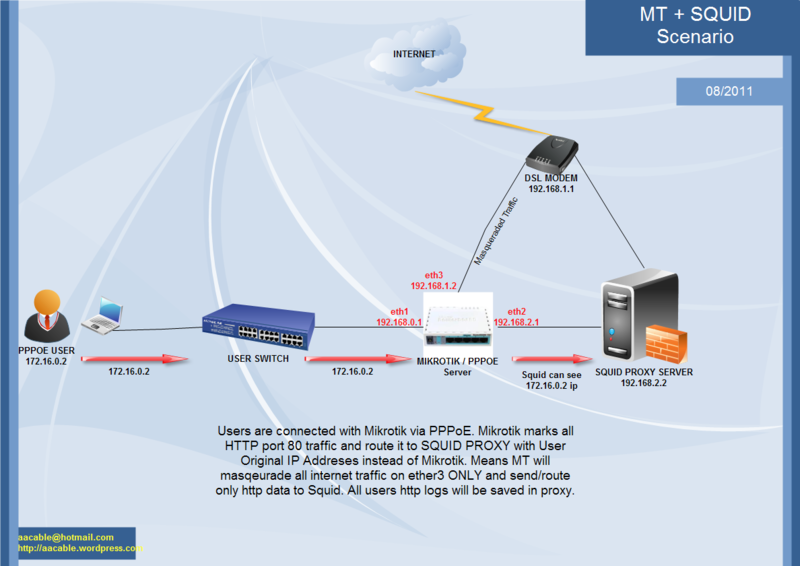 . .
Howto connect SQUID box with Mikrotik and Log user’s original source ip in squid proxy log. In this scenario Mikrotik is acting as PPPoE Server. All internet traffic is passed from Mikrotik, except the HTTP PORT 80 data, which is marked and route to SQUID proxy server for caching facility and some other filtering task. We want to preserve source client IP address in squid logs, so that user web activity can be tracked via squid access log, sometimes it can be require by law enforcing agencies or can be required by administration / reporting / management purposes. So how to do it ? 1# MIKROTIK RouterOS CONFIGURATION ! 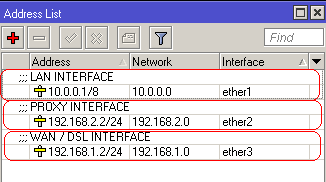 In this example, Mikrotik have 3 LAN interfaces, Details are as following . . .
# Mark All HTTP Port 80 Traffic, so that we can use these Marked Packets in Route section. # Masquerade all traffic (Except http] on ether3 Only, which is connected with DSL Router. This is important to masquerade traffic on WAN Interface only, otherwise http packets will also be masqueraded with mikrotik ip. That’s all for MIKROTIK, Now Mikrotik will Redirect HTTP Traffic to Squid Proxy via interface ether2. and all rest of traffic will be masqueraded/nat to WAN (ether3) which is connected with DSL. Now moving on to SQUID section ! 2# SQUID Proxy Server CONFIGURATION ! # DNAT port 80 request comming from LAN systems to squid 8080 aka transparent proxy .zaib. That’s it. Now when user will try to use internet, his HTTP traffic will be marked by Mikrotik and then all HTTP marked traffic will be ROUTED to SQUID proxy [192.168.2.2] with original client ip, instead of Mikrotik ip. Some useful links for fine tuned working squid.conf and Linux internet sharing script.